Follow the legendary Lyra and Elron as they uncover treasures from outter space with this online video slot by Microgaming. The reel structure is an unusual one, shaped like a diamond. There are in total 10 paylines to be discovered. 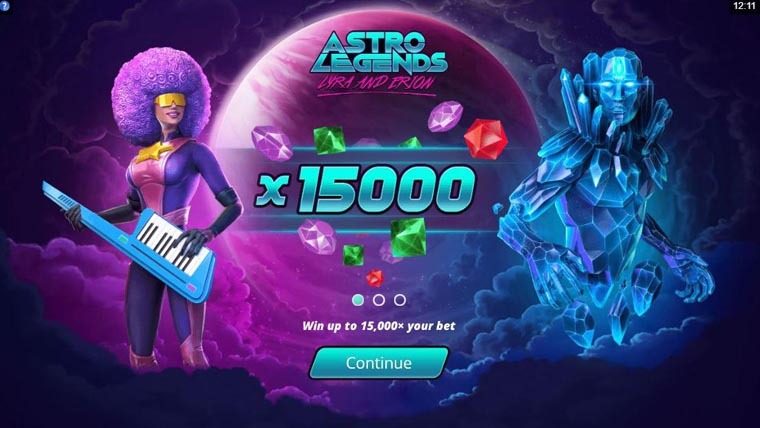 The starting bet of Astro Legends is of €010 and it can go as high as €20. The RTP is of 96.63% and the game has high volatility. The Multiplier Wild can substitute for any symbol and has a multiplier value chosen at random of up to 5x. If more than one Multiplier Wilds is part of a win line, then the multipliers associated to them are added. Id all winning clusters are made up of the same symbol, then a Sonic Re-spin will be granted to you. The initial symbols are held in place, while the rest spin again. For another cluster of at least 5 symbols and you’ll be granted another re-spin. A Stardust Bubble can appear at random anywhere on the reels. It lands on a symbol and once Lyra burst it, a random number between 2 and 10 is added to the Stardust Collection. When 100 points are collected, Lyra will turn into a wolf and the Lyra Spirit Bonus will be activated. The Lyra Spirit Bonus starts with the wolf having 3 lives. This feature has 7 levels and on each level, you can choose 1 of 3 paths. The Wolf will randomly collect gems. Starting from level 4, you will be able to randomly hit 2 paths. If you finish level 7 with at least one extra life, you’ll be in for a bonus of up to 20x. Why play it: Play Astro Legends for it id a display of gameplay design mastery – the adventure like feel of the Lyra Spirit Bonus, and the thrill of the Sonic Re-spin, as well as the incredible character design of the to heroes, will mesmerise you and make you hold your breath as the slot unravels its secrets.